The 2PCM double-toothed roller crusher is an improved model of the old 2PGC double-toothed roller crusher. It is composed of a transmission device, a frame portion, two oppositely rotating tooth rollers, a mechanical spring device, a linkage mechanism and the like. 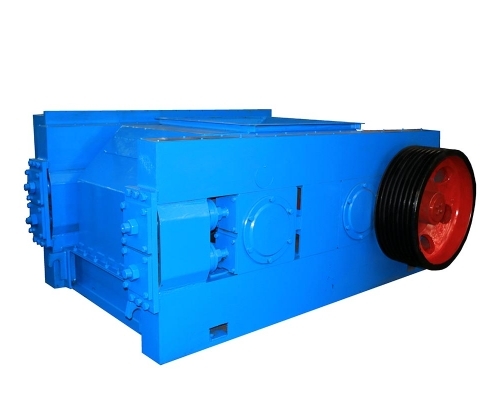 When the toothed roller rotates, the teeth on the surface of the roller can bite and crush the coal block, and the material is fed from the upper portion, and is broken and discharged from the lower portion as the tooth roller rotates. The particle size of the product is determined by the gap between the two toothed rolls. When the hard material falls into the crushing chamber and cannot be broken, the force of the toothed roller increases, the movable roller bearing seat compresses the spring device, and the gap between the two toothed rollers increases, discharging hard. The restoring force of the spring then returns the movable roller to its original position. It is suitable for medium and hard brittle materials with crushing compressive strength of 50-70MPa, suitable for metallurgy, chemical, mining, building materials and other industries. 4. The particle size control is strict, and the particle size adjustment range is wide. 2. Material characteristics, feeding size and discharging size should be presented in the contract.